With its many turrets, secret passages, and stairways to nowhere, the Winchester Mystery House has intrigued and fascinated visitors for almost 100 years. Located south of San Francisco in San Jose, the unusual house was begun in 1884 by Sarah Winchester, the widow of gun manufacturer, William Wirt Winchester. The house became Mrs. Winchester's obsession and construction on the house continued 24 hours a day, seven days a week until her death in 1922. The result is a huge mansion with no overall plan, interesting, but odd. The idea of the Winchester House, called "Llanda Villa" during Mrs. Winchester's lifetime, was conceived as an escape from the tragic early death of Mr. Winchester and the death of their infant daughter 15 years earlier. On the advice of a medium, Mrs. Winchester left her east coast home for the Bay area. The medium advised her to build a grand home and to continue building to appease the spirits of those killed by Winchester rifles, whom the medium said took her husband and daughter. The Winchester House has 160 rooms, 1257 windows, and 950 doors, some leading nowhere. The house cost $5.5 million dollars and was under construction for 38 continuous years. It includes 40 bedrooms and 47 fireplaces. The house is not all whimsy, however. It features modern (for the day) conveniences, such as central heating and sewer systems, gaslights with push-button switches, and three elevators. There are also many artistic touches, such as original Tiffany windows and inlaid parquet floors (see the picture of the ballroom at left). Is the Winchester House haunted? Mrs. Winchester's fascination (fixation?) on the number thirteen is evident throughout the house. Bathroom #13 has thirteen windows; one of the kitchen sinks has thirteen drain holes; and she modified the normally twelve-light chandeliers throughout the house to be thirteen-light fixtures. Some staff and visitors have reported spiritual sightings and there are rumors that the house is haunted, presumably by those shot with Winchester rifles. The house and its story was the basic for Stephen King's novel, "Red Rose." The Winchester Mystery House hosts a series of events throughout the year. Among the most popular are the flashlight tours, held each Friday the 13th, on October 31, and on selected weekend days preceding Halloween. On the nighttime tours, visitors are given a souvenir flashlight, the only light (except for the moon) to aid them in exploring the numerous passageways and staircases of the mansion. 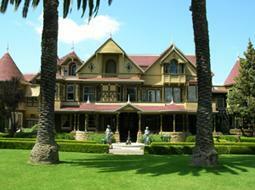 The Winchester Mystery House is located just south of San Francisco in central San Jose. The house is easily accessible by car from I-280. The Winchester Mystery House is open daily, except for December 25. Hours are 9am - 5pm from October 8 to April 27 and from 9am - 7pm from April 28 to October 7. A variety of tours are offered ranging from $18.95 to $26.95 for adults and $17.95 to $23.95 for children. Annual passes are also available. Visitors may also enjoy a snack or beverage at the Winchester Cafe or browse through a wide variety of souvenirs, books, and interesting objects at the Winchester Card and Gift Shop, located on the property.